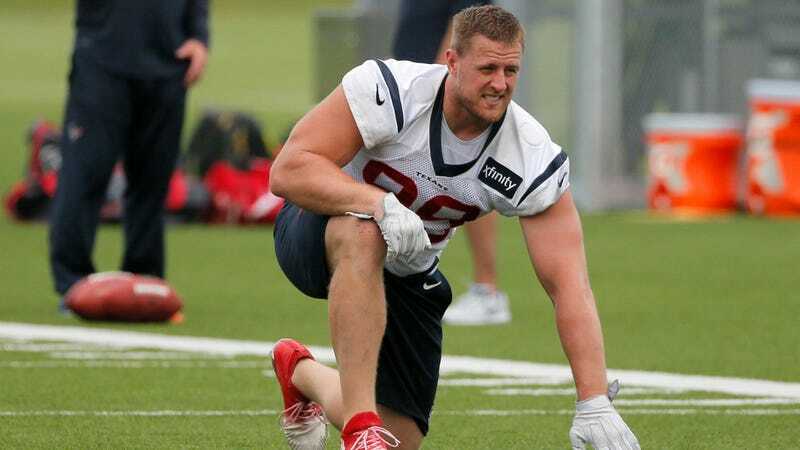 J.J. Watt, image via the AP. Yesss put down your DraftKings app, Jezebel readers (jk, jk). NFL player J.J. Watt of the Houston Texans started an online fundraiser last Sunday for Hurricane Harvey victims with a modest $200,000 goal and has now reached $17.5 million [UPDATE 15 minutes later: $17.8 million]. To put that number in perspective, an NFL team could buy J.J. Watt for that kind of money. That means nothing to me, so to put it another way, that sum could almost get you Kim Kardashian and Kanye West’s estate. The fundraiser lists $1 million from Ellen Degeneres (with Walmart), $1 million from the Tennessee Titans, and $200,000 from Drake. Jamie Foxx is planning to hold a telethon on September 12th, and Kevin Hart has made an online fundraiser which has so far raised over $1 million. Other vast sums reportedly donated by celebrities include, but are not limited to: $1 million from Leonardo DiCaprio; $1 million from Tyler Perry; $500,000 from Miley; $500,000 from the Kardashians; $1 million from Sandra Bullock; and an unspecified “sizable donation” to the Houston food bank from Taylor Swift. Barack Obama recommended donating to the Red Cross on Twitter. A friendly reminder that ProPublica investigated the Red Cross in 2015 and found that of half a million dollars raised for Haiti, the organization only built six homes. ProPublica then recommended donating to local organizations with direct ties to their communities. Here’s our guide. For those prepared to take on the heavy burden of being Taylor Swift’s BFF, prepare for your wedding to sound like this: “BOOOO NOOOO TAYLORRR NOOOO.” Yesterday Taylor Swift served as a bridesmaid to her lifelong BFF Abigail Anderson, and TMZ camped out outside to get video of fans yelling at her as guards hid her exit. Melania Trump wore insensitively expensive clothes to Houston twice this week with a $1590 khaki jacket dress and $500 Manolo heels, which is coincidentally also how the President spells “heals.” For her that’s actually quite restrained.